In the first of a potential new series Florian Richter presents colour profile models of every ship on both sides in this epic battle. In a change to previous paper soldier titles, these ships can be cut straight out of the book to create the British, French and Spanish fleets. Florian grew up in Germany, where wargaming is more unusual even than in Britain or the US. His interest in Roman and Napoleonic military history led him to build his own paper and coin armies before he discovered that wargaming was a real hobby. Today he plays both hex and counter and miniature games. 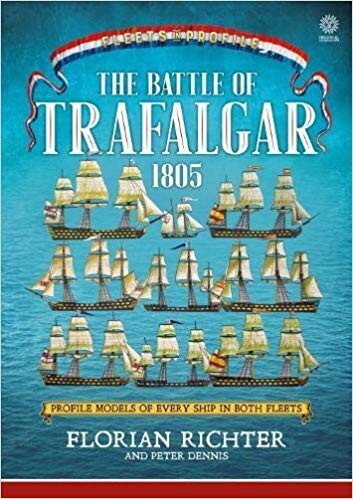 CS Forester’s Hornblower novels engendered a fascination for Napoleonic naval history, which combined with his interest in paper modelling and illustration makes him ideally qualified to be the creator of the Trafalgar profile model book. Florian graduated in East Asian Studies at Heidelberg and lives in Hamburg, Germany. Peter has made his living as a freelance illustrator for 40 years, mostly working on historical subjects, notably in recent years for Osprey in the UK, and for various wargame figure manufacturers in the form of box art. Jacobites were the subject of his first experiments with paper soldiers. He is half-Scottish and the subject has always had a special appeal. Castles formed a major theme in his days as a children’s book illustrator so in ‘Castle assault’ he is returning to his illustrative roots and squeezing as much masonry and siege equipment as he can into the format, alongside Bannockburn and more Scottish heroics. Peter has played with toy soldiers in one way or another for most of his life, and his work and hobby come together in this paper soldier revival project with Helion books. He lives in Mansfield, Nottinghamshire, in the UK.